This is a blog dedicated to USAF pilots and test pilots, there flight gear and jackets. I am mainly focusing on the years 1946 through to 1969, I aim to share many images found on the web, that otherwise would just be sitting on my hard drive! Great photos! Looking forward to seeing more. Nice idea Stu, a great selection of shots. You’re inspiring me to do something similar. Fantastic ! Great view! Thank you very much ! Absolutely love this blog, I’ve added it to my favorites. Much appreciate your work! Was that photo of the pilot in front of the F-100 from the cover of “Jet Pilot Overseas” by Henry Lent and is “Ronca” the pilot shown in that photo ? Later I was a crew chief on F-4s in England. Fantastic ! Just like what i like… US pilots in flight gear of the 50’s with their supersonic (or not) aircraft…. Photos of pilots with the protos XF3H Demon, F3H-1N, F4H-1, Skyrocket and Skystreak, XF-92, YF-102, XF-88 A and B and so on are welcome ! But where is the Navy? Amazing collection of photo’s, keep up the good work! Great site with rare photos- especially the color shots. Interested in this period of USAF history since my father was a pilot on F/RF-84F, RB-57A and F-100. Thanks. Specifically An L-2A From The Korean War That I’m Contemplating Putting On eBay..? Thanks for the review! Have you tried joining the vitage leather jacket forum at http://www.vintageleatherjackets.org they are really helpful and also have a forum on Nylon jackets and would be pleased to help you with information on your L-2a. I came upon your blog through a Google image search for Ray Ban g-15 aviators in an aviation context for my own wordpress blog. Good looking page If I might say, haha, I also am running the Modularity lite theme. Anyways, I was messaging to see if you would mind me using three photos from your archive to use on mine? I also wanted to know if you mind adding you to my blogroll. My blog is also 50s and 60s themed heritage items meshed with the throwback well-made items of today. I also do have a great interest in aviation, as it pertains to my profession. Anyways, I just wanted to ask those things, and give you a big thumbs up on your site. This is better than any of the published books on Flight Helmets I have! An absolutely fantastic source for researchers and collectors. Great site. I was wandering if I may use some photos in veteran video interviews I do as a hobby. I noticed that a lot of them are from “Life”, so I wasn’t sure if that was possible. Any help would be appreciatied. Absolutely superb photos. I am very interested in early USAF , and have yet to find a better resource than this. Amazing, keep up the good work. Great Photos! The Webb photos that were just posted are very rare. Any other UPT photos from that era would be really great. Do all of these come from LIFE? I am fond of this era of aviation history – the golden age! Many great pretty rare pictures of fine quality! I have some questions I would ask the webmaster directly by e-mail, if it is possible. Thanks in advance for your reply / help. I am hooked! Very nice work. I also really liked the recent Astronaut postings. Many happy moments have now been frittered away sipping coffee and rummaging through this site in the last few weeks. Thanks! Stu I am currently, MAking a documentary about apollo Astronaut Stu Roosa. and would like to ask your permission to show a couple of pictures from your blog . If there are copywriter issues, please let me know. This is a fabulous website. If possible do you sell the pictures or high resolution jpeg images? My father is in one photo and I’d like to buy it for him. Also I am trying to find out about a crash that happened in Ohio in the 1960s. No one was hurt, and the pilots were able to eject. If anyone has information I would appreciate it. I don’t sell the images as they are all to be found on the web somewhere, If you let me know which one your father is in I’ll see if I can find out where I got it from and send you the information, they will probably be able to help you. Stu, thank you again for all photos you find and share on this fabulous blog. I’ve been sharing your website with everyone on my email list. Absolutely great stuff. I would also like to share some of the photos in the book Into the Blue, USAF Uniforms 1945 – Present. I have vol 1 out there and can be purchased through Schiffer Publishers or Amazon.com. May main purpose for the books is to share with other vets and historians. I feel as you do that these photos should be out there and not hidden away from the public. I’d love to hear from you. Lance, I love your book, when is vol 2 coming out?? Thank you for your hard work!!! Here is another video I did using photos from your website here. I hope you like it. Let me know. That looks great, Thank for taking the time and effort to put something together. I love your web site and visit it frequently to see new photos. You have some really excellent photos here—not just the subject matter, but the quality of most of them is fabulous…. I was amused by the latest photo of the Air Force Academy cadet standing on the boarding ladder of the Lockheed T-33A Shooting Star, because I have the exact picture of myself, taken January 23, 1969, at Peterson Field, Colorado Springs, CO. I don’t recall Cadet Abernathy, but there were 1,407 cadets who entered with the Class of 1973. Come on don’t be shy, let see it and immortalize you here! Love your blog to, hope to but a blog to a face soon! Please contact me through my email address – thank you. I’d like to use some Korean War Mustang photos from your blog in my upcoming Mustang book and need to know how best to credit them – also I need your name. I’m new to this blog. How do I post photos? My dad, Gene Ray Johnson, was an F-84 pilot in Korea with the 16th FIS of the 51st FIW, the 111th FBS of the 136th FBG, and the 69th FBS of the 58th FBG. He later served with the 559th and 560th Strategic Fighter Squadrons at Randolph AFB. I would love to hear from anyone who knew or flew with my dad. Thanks for the great website. The Pilot on the Jacket cover of the book Jet Pilots Overseas is Lt Col. Louis R. Batson Jr. RET. Any back story on the Chuck Yeager / Barbara Eden I dream of Jennie photo? I know one of the NASA Dryden buildings served as Cape Kennedy but not sure where the photo came in. 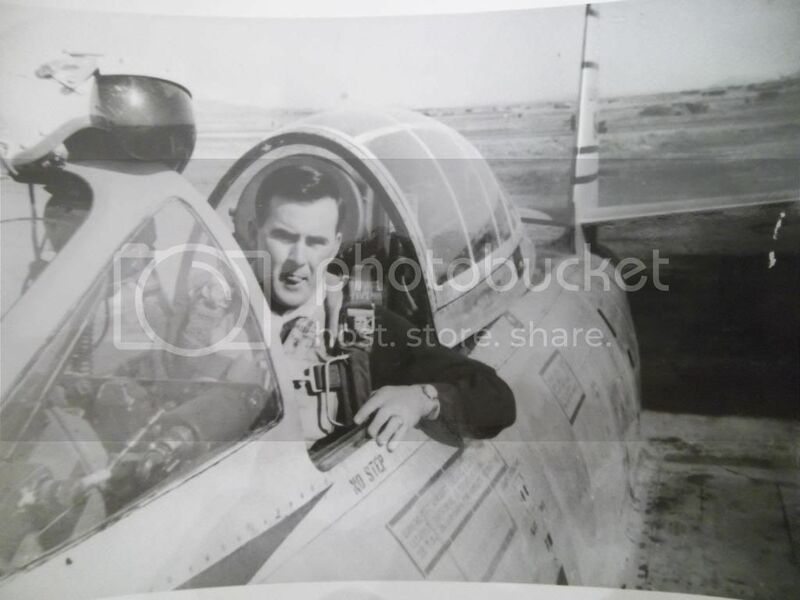 Can you tell me anything about the image labeled 1-ladd-fld-crew0001-paul-warner1 SAC ? I recognized my father in it. He never spoke much about what they were doing in 55th SRW. Sealed orders, arctic gear, long missions,etc. He is 88 and I’d love to prod him with some questions. Love your site! I first read Jet Pilot Overseas as an AF brat living at RAF Lakenheath in the early sixties! Checked it out numerous time from the base library! It was my favourite book! Definitely inspired my decision to become a USAF Navigator/WSO and a pilot. Keep up the good work and I will try to dig up some photos of my dad from his days at Furstenfelbruck AB, Kelly and Luke AFBs plus Chaumont AB, RAF Lakenheath and Langley AFB. Being new to the site, I can only congratulate you on it’s excellence. As a former F-84F pilot in the Royal Netherlands Air Force I always had a special liking for the first Jet I flew operationally. Thanks for a great website. Hi I really enjoy receiving the updates. Could you include some C-45 stuff please. Great website, glad I found it. Oh, and thanks for putting a picture of my Dad on your website! He looks good here. Hi, My name is Yuma Shishido looking for Flight Jacket collector for Japanese Magazine shoot July 15-18, Around East Coast area. We want to go visit them and take Collection and Collectors Photo. Nice color pics of the RF-51. They were lifted from my website without permission. Nice use of them though. I cannot thank you enough. Absolutely stunning pictures. Simply treasures. Excellent pictures! Thanks for putting all these up. FYI – the F-100 pilot on the far left of the seventh picture is James F. Low, Korean War ace. Happened on your site by accident – very cool. There are a couple of pictures of my Uncle Don (NDANG) where he appears as unkown or misnamed; would be pleased to assist by providing his details. He and three others perished in 1969 while flying the Happy Hooligans’ C-54. thanks for the web site. Found a old photo of my Dad in 1967. Top notch site. A real pleasure to view such great aviation photos. What a fantastic collection! I’m publishing a book on SAC’s first twenty years, and am interested in using some of the photos you have here. If I identify photos, can you tell me where you got them so that I can pursue permissions? Un saludo desde Villa Mercedes San Luis Argentina y que sigan esos muy buenos Vuelos..!!! Hola.! Muchisimas gracias por la informacion, interesantisima.! me dedico al Vuelo Termico y siempre me ha gustado la historia de la Aviacion en gral. Los saludo con un gran abrazo..! As President of the B-58 Hustler Association, I would appreciate having our site listed.